I love Phoenix! Been missing them lately. 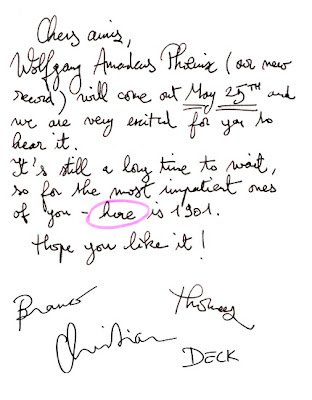 Luckily I woke up today to see a bulletin/note on their Myspace announcing the release of New Album 'Wolfgang Amadeus Phoenix' on May the 25th! Since the release is still month's away they've been kind enough to give away a FREE Track, '1901' to hold us off :: www.wearephoenix.com. Great Track!! Has that Classic Phoenix sound. Delicious guitar/synth goodness that they do so well.